When I worked at the Chicago Department of Transportation, I was able to contribute to the development of the Chicago Pedestrian Safety campaign which was funded by the National Highway Traffic Safety Administration. There were a number of elements to the campaign, but one component that I was able to work on was the Chicago Taxi 311 Bumper Sticker. 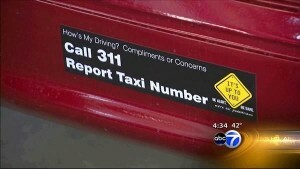 This was a collaboration between the Chicago Department of Transportation and the Department of Consumer Services, which involved a “how is my driving” styled bumper sticker to be placed on all taxis in the city. My contribution was small in the fact that I helped to design the sticker but every time I visit Chicago there is a constant reminder on all taxis of my time with the Department.